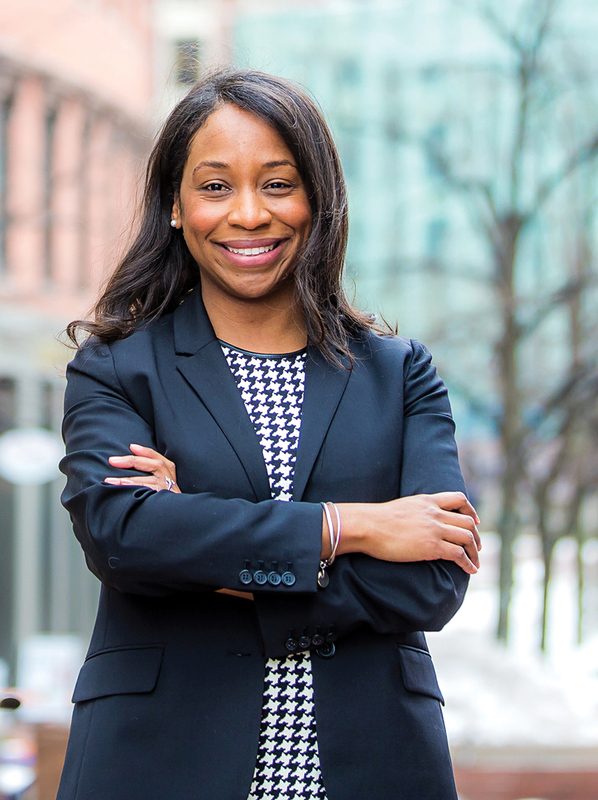 If you want to see the future of Boston, look no further than Andrea Campbell. Raised in Roxbury and the South End, she blazed through Boston Latin, Princeton, and UCLA Law School, only to return home with a clear message: The old guard is done; make way for the new. She started in 2015 by toppling longtime incumbent Charles Yancey in an election for the District 4 city council seat. Last fall she was named city council president, the first African-American woman to hold the position since the body’s founding in 1909. The 35-year-old met me in her new office in City Hall to talk about a chance encounter with Maya Angelou, how her twin brother’s death influenced her political ambitions, and her vision to transform one of Boston’s most overlooked neighborhoods. Congratulations on being appointed city council president. Did outgoing President Michelle Wu give you any tips? She left a lovely note on my desk on the first day, and apparently that’s a tradition when each former president leaves. And she continues to be a resource and has made herself available any time I call. Does it change your relationship with her now that she has to call you President Campbell instead of you calling her President Wu? So you didn’t go home and tell everyone in your life, “It’s Madam President now”? No. Although some of my relatives insist on calling me that. It brings them joy and happiness, and I don’t want to take that away from them. You left Boston for college at Princeton and then law school at UCLA. What brought you back? One was my husband. Two was losing my twin brother, Andre—he was toward the end of his life, and I was already thinking about transitioning back to Boston to be supportive of him. And when it looked like his health wasn’t going to improve, I decided to make the transition back permanently. And I’m glad I did. I found my purpose here, frankly, to serve the neighborhoods and constituencies that I grew up in and that reflect my own family. When you were growing up, did you and your brother have a secret twin language or anything like that? No, but we had a special connection. When we were being placed in foster care, there was a tendency to keep twins together. My other brother, Alvin, who was two years older, he was sort of often an afterthought—but it was always, “Keep the twins together, keep the twins together.” So Andre and I were extremely close because we grew up together. Andre passed away from an illness while in prison awaiting trial, and other members of your family have been in the criminal justice system. How has that shaped your ambitions? I would say my father, my twin brother, and my older brother—their interactions with the criminal justice system play a huge role in the work that I do today. I came to the city council wanting to work with my colleagues on issues affecting criminal justice. My twin brother cycled in and out of the system and died while in the custody of the Department of Correction as a pretrial detainee. I always stress the pretrial detainee part, because we often talk about pretrial detainees—individuals who have yet to be found guilty of anything—in the context of, say, Guantanamo Bay. But that’s not the reality. In Massachusetts, there are folks who are being held in the prison system with very high bail amounts and are either wasting away because they have severe health issues and aren’t getting appropriate care or are almost being punished before they actually go through a trial process. If you’re being held for two years and you have yet to have a trial to determine whether you’re innocent or guilty, for me, I view that as punishment. What can politicians do differently when it comes to criminal justice? As leaders in a political space, we have to not only have that sense of empathy but also compassion, and when I think about the experience my twin brother went through over the years—who was suffering with a disease, who had a doctor who said, “If this young man is kept in a prison setting he will die”—and still it was a struggle to get him placed in the hospital to get care. It was a struggle to get the system to respond to his needs, because I think people didn’t view him as a human being. They viewed him as a criminal; they viewed him as an inmate. So we have to change our lens on how we view folks in the system and we have to think honestly about our biases. How did you convert the experience of losing your brother into meaningful action? It is not easy. This January was six years since Andre passed away. I think about how intelligent he was, how funny he was, how loving he was, how humble he was. I couldn’t reconcile that someone else in the system couldn’t see that, and treat him accordingly. Through tremendous prayer and support of family, and choosing to turn that pain over to God, and share it with others—that inspires you to take this hardship and use it as a source of inspiration. Of course! But it has a reputation of being dangerous and economically neglected. How do you counter that narrative when speaking to the broader city? I tell folks to come and hang out in Mattapan. Many folks who have the sense that that is what Mattapan is all about have not spent time, or sufficient time, there. If you come and spend time—whether it’s on my street or at the local civic association that one of my favorite residents brings together monthly—you’ll see that Mattapan is about civic engagement, neighbors looking out for each other, residents taking strolls. It is diverse in so many respects. It’s an exciting place to live. And it is not exciting because we have incidents of violence. Every part of the city has incidents of violence. Every part of the city needs more affordable housing. Every part of the city has some schools that could be doing better. Mattapan, like every other part of the city, shares those issues. What would you like to see change in your district, which also includes Dorchester? For Mattapan Square and Codman Square, I want to see robust economic districts—small-business districts that are vibrant, where you see bustling activity, coffee shops, restaurants, and a diversity of businesses. Look at Dorchester Avenue in Lower Mills, for example. It has the bank, the pet shop, the dry cleaners, the Dunkin’ Donuts, several restaurants. I want to see that sense of vibrancy and to have it supported not just by the city, but by private dollars and by philanthropy. Let’s do a lightning round about Boston’s 13 city councilors. Which one would you call to change a flat tire? I love that! Tim McCarthy [of District 5]. Who would you have stay on the phone to help you cancel your cable contract? Lydia Edwards [of District 1]. She’s an advocate. How about to get a book recommendation? To go see the new Star Wars with you? [Laughs]. Mark Ciommo [of District 9]. The person who’d defend everything Tom Brady has ever done no matter what weird food he recommends eating? I might say McCarthy again. I could also say Michael Flaherty [at large]. Who would be the best person to help break bad news? How about to help you assemble IKEA furniture? Frank Baker [of District 3]. What’s up with the Muhammad Ali poster next to your desk? Muhammad Ali is up there because my husband and I both admire him—and not just his skill and discipline to be a great fighter. I enjoy watching boxing; I grew up watching with my father. But when [Ali’s heavyweight title was] taken away from him, when he chose not to serve in Vietnam, he said, “I’m not going over there until we change how we treat people of color here.” Everything was taken away from him at the peak of his career, and just to watch him still carry himself with a sense of grace and optimism and hope—that’s what resonates with me. He was courageous; he was bold. But when it was all taken away, he was still courageous, he was still bold, and he was gracious, and that means something to me. How do you maintain that sense of humility when you are in a role that does afford you power, that does afford you access? It is incumbent upon us to continue that humility. I also have a picture with Maya Angelou, who could very much be on that wall. I met her when I was in middle school, and she remains an inspiration to me because she saw something in me one day and I barely knew who she was. It was at the Peace Abbey in Millis, Massachusetts, and she was coming to get the Courage of Conscience Award. My Aunt Dot, who was one of my foster parents and who is still in my life today, invited me to come. So I walk in, and Maya Angelou insists that I sit next to her. And I sit down with her and she explains to me she had just come back from Africa. She was in Ghana. And she says to me, “I learned a new term and the term is kra.” And she spelled it out on a piece of paper and there was an accent you had to put underneath one of the letters. And she says, “In Ghana, there is this tradition where elder women pass on—they do a ceremony. And the spirit of that elder is passed on in that ceremony to someone else.” Maya Angelou then looks at me and says, “You are my kra.” In the moment I think I said, “Wow!” and I still didn’t understand it as a middle school student. And my Aunt Dot captured that picture of us and I’ll never forget. And now here we are. And now you’re the first African-American woman to be city council president. Does that add pressure for you? I think any time you’re the first, there is a level of expectation that adds pressure. But at the same time, I tell myself that if I continue to work hard and continue to put God first in the work, I’ll be just fine. You’re on the most diverse city council in history. What made that happen? Is it in response to Donald Trump? I think Trump’s election played a role, but I think even before that there were men and women who were working on making sure that government was reflective of the demographics of the city, whether it’s electing more women or more folks of color. We all have a role to play, and I give credit to our residents. Given Boston’s troubled history around issues of race, does this feel like a sea change at all? This is a moment in time that we should all be very proud of. Because now we have the opportunity to go even further. Standing up there and giving my inaugural speech at the first council meeting and looking at the councilors before me was very moving. I think that’s when I began to process for myself what it meant to be the first African-American woman, taking into consideration what it means to be the most diverse council in the history of Boston. That is very powerful, and we’re not going back. We’re only going forward.